Tis' the season that cookie sheets get a run for their money so why not make them look their best. Jill has a great two ingredient miracle cleaner, baking soda and peroxide, that will clean your cookie sheets right up. 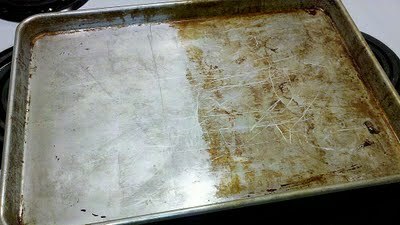 You can check out how to clean your cookie sheets over at One Good Thing. This is exactly what I have been needing. Thanks! I tried this and unfortunately it did not work for me... maybe it was that my pan was a different surface than hers?? I used to really need to know how to do this. Then I abandoned evil PAM spray in favor of Silpat sheets. And my (new) cookie sheets rejoiced. Thanks for the shout out Lorie! LOVE LOVE LOVE your site! For those of you still battling with the cookie sheet gunk...I have a couple of updates worth looking at! Janell....you are SO right on there! I NEVER put anything directly on my pans anymore! Learned my lesson. :-) I'm just trying to resurrect the pans I abused before learning it. lol. Doug, were your pans dark from baked oil or are they discolored from being put in the dishwasher? This worked on the oil issues (dark spots) but some of my cookie sheets are discolored from oxidation in the dishwasher. There isn't much to do about that.